Blackjack Switch is the modification of the card game that uses 6 decks of 52 cards, allows you to trade cards between 2 hands and follows the "Las Vegas Strip rules" with some exceptions. The object of Blackjack Switch is for the your cards' total in either hand to be closer to 21 than the dealer's cards, without exceeding 21. Card values are the standard: Aces count as either 1 or 11, face cards as 10, and number cards as their face value. The rules are basically the same as in standard blackjack. Except you have 2 hands, which you play in turn - first the right and then the left one, then the dealer plays his hand. You may split, double, take insurance just like in standard blackjack. The only exception is that the dealer always hits soft 17, so he always draws one more card when he has 17 with an Ace counted as 11. Also, "Blackjack" pays only 1:1 instead of 3:2 although more "Blackjacks" are created due to the hand "switching" option. Another exception is that Blackjack rule no. 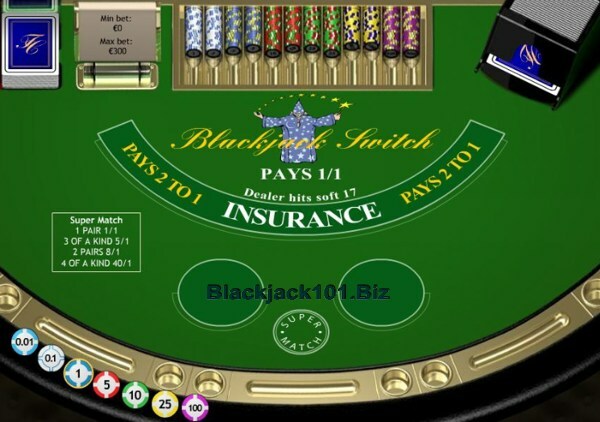 5 (“If the player doubles and the dealer’s first card is of value 10, and the dealer gets blackjack, the player loses only the initial bet.”) does not apply in Blackjack Switch. This is an American hole card game, e.g. the dealer peeks for Blackjack. If the dealer's up card is an Ace or a 10-card, the dealer will peek at his cards to check for Blackjack before the player makes his moves. If the dealer does have Blackjack and the player doesn't, the dealer will win and the game round will be over. If either of the player's two initial hands makes up Blackjack, that hand pushes against the dealer and the bet for it is returned to the player. Prior to any hits, you may switch the top cards of your 2 hands. Dealer will "push" on a total of 22 (except Blackjacks will still win). Whenever the dealer's hand total reaches 22 then all bets are 'pushed', regardless of their total except if a player either has a 'Blackjack', which will still win, or has Bust, which will still lose. There is a small "super bet" circle between the standard bet areas. The super bet wins if your initial 4 cards contain 2 or more matching cards. For example, if your right hand is a Queen and a Seven, and your left hand a Queen and a Jack, you have a pair and your super bet wins. The win ratios are written on the table - your payout will be from 1:1 for a pair up to 40:1 for 4 of a kind. If your first 2 cards have the same value, you may split them into 2 separate hands by placing a second bet equal to the original bet. You'll then draw additional cards to each hand. You may draw as many cards as you like on each split hand, but you'll receive only one card if you split 2 Aces. If you receive an Ace and a 10-value card in a split hand, it is not considered Blackjack, just 21-value hand. If the dealer shows an Ace in his initial hand, you are given a chance to insure your bet against him having a Blackjack. If you get Insurance, an amount equal to half your original bet is placed separately on the table. If the dealer does have Blackjack, you are paid 2 : 1 on your insurance bet. This way you do not lose your original bet (you get the 2x half your original bet, plus the insurance bet back). If the dealer does not have Blackjack, you lose the insurance bet. The strategy card is printed as table with the Dealer's up card the first row and player's 2-card combination the second column. The letters tell you what to do (Hit, Stand, Double Down or Split) depending on the different combinations of dealer's and player's hands. Optimal Blackjack Switch strategy tables for Playtech's rules are shown above for player's hard totals, soft totals, and pairs along with a legend. Try our no download Flash-based Playtech free blackjack game to test your skills. The game was presented by Casino Tropez - popular international online casino, one of the leader in Europe due to multi-lingual customer support and localized casino software. Tropez offers you to play 6 different versions of Playtech blackjack games, like BJ switch, single deck, 21 Duel, pontoon and surrender. Claim up to €/£/$ 2,400 in welcome bonuses per year.